Gregory of Nyssa, also known as Gregory Nyssen (Greek: Γρηγόριος Νύσσης; c. 335 – c. 395), was bishop of Nyssa from 372 to 376 and from 378 until his death. He is venerated as a saint in Roman Catholicism, Eastern Orthodoxy, Oriental Orthodoxy, and Anglicanism. Gregory, his elder brother Basil of Caesarea, and their friend Gregory of Nazianzus are collectively known as the Cappadocian Fathers. Gregory lacked the administrative ability of his brother Basil or the contemporary influence of Gregory of Nazianzus, but he was an erudite theologian who made significant contributions to the doctrine of the Trinity and the Nicene Creed. Gregory's philosophical writings were influenced by Origen. Since the mid-twentieth century, there has been a significant increase in interest in Gregory's works from the academic community, particularly involving universal salvation, which has resulted in challenges to many traditional interpretations of his theology. The book of Acts depicts that on the Day of Pentecost there were visiting Jews who were "residents of...Cappadocia" in attendance. In the First Epistle of Peter, written after AD 65, the author greets Christians who are "exiles scattered throughout…Cappadocia." There is no further reference to Cappadocia in the rest of the New Testament. Christianity arose in Cappadocia relatively late with no evidence of a Christian community before the late second century AD. Alexander of Jerusalem was the first bishop of the province in the early to mid third century, a period in which Christians suffered persecution from the local Roman authorities. The community remained very small throughout the third century: when Gregory Thaumaturgus acceded to the bishopric in c. 250, according to his namesake, the Nyssen, there were only seventeen members of the Church in Caesarea. Cappadocian bishops were among those at the Council of Nicaea. Because of the broad distribution of the population, rural bishops [χωρεπισκοποι] were appointed to support the Bishop of Caesarea. During the late fourth century there were around fifty of them. 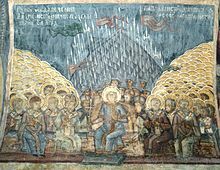 In Gregory's lifetime, the Christians of Cappadocia were devout, with the cults of the Forty Martyrs of Sebaste and Saint George being particularly significant and represented by a considerable monastic presence. There were some adherents of heretical branches of Christianity, most notably Arians, Encratites and Messalians. Gregory was born around 335, probably in or near the city of Neocaesarea, Pontus. His family was aristocratic and Christian - according to Gregory of Nazianzus, his mother was Emmelia of Caesarea, and his father, a rhetorician, has been identified either as Basil the Elder or as a Gregory. Among his eight siblings were St. Macrina the Younger, St. Naucratius, St. Peter of Sebaste and St. Basil of Caesarea. The precise number of children in the family was historically contentious: the commentary on 30 May in the Acta Sanctorum, for example, initially states that they were nine, before describing Peter as the tenth child. It has been established that this confusion occurred due to the death of one son in infancy, leading to ambiguities in Gregory's own writings. Gregory's parents had suffered persecution for their faith: he writes that they "had their goods confiscated for confessing Christ." Gregory's paternal grandmother, Macrina the Elder is also revered as a saint and his maternal grandfather was a martyr as Gregory put it "killed by Imperial wrath" under the persecution of the Roman Emperor Maximinus II. Between the 320's to the early 340's the family rebuilt its fortunes, with Gregory's father working in the city of Neocaeaseria as an advocate and rhetorician. Gregory's temperament is said to be quiet and meek, in contrast to his brother Basil who was known to be much more outspoken. Gregory was first educated at home, by his mother Emmelia and sister Macrina. Little is known of what further education he received. Apocryphal hagiographies depict him studying at Athens, but this is speculation probably based on the life of his brother Basil. It seems more likely that he continued his studies in Caesarea, where he read classical literature, philosophy and perhaps medicine. Gregory himself claimed that his only teachers were Basil, "Paul, John and the rest of the Apostles and prophets". While his brothers Basil and Naucratius lived as hermits from c. 355, Gregory initially pursued a non-ecclesiastical career as a rhetorician. He did however, act as a lector. He is known to have married a woman named Theosebia during this period, who is sometimes identified with Theosebia the Deaconess, venerated as a saint by Orthodox Christianity. This is controversial, however, and other commentators suggest that Theosebia the Deaconess was one of Gregory's sisters. In 371, the Emperor Valens split Cappadocia into two new provinces, Cappadocia Prima and Cappadocia Secunda. This resulted in complex changes in ecclesiastical boundaries, during which several new bishoprics were created. Gregory was elected bishop of the new see of Nyssa in 372, presumably with the support of his brother Basil, who was metropolitan of Caesarea. Gregory's early policies as bishop often went against those of Basil : for instance, while his brother condemned the Sabellianist followers of Marcellus of Ancyra as heretics, Gregory may have tried to reconcile them with the church. Gregory faced opposition to his reign in Nyssa, and, in 373 Amphilochius, bishop of Iconium had to visit the city to quell discontent. In 375 Desmothenes of Pontus convened a synod at Ancyra to try Gregory on charges of embezzlement of church funds and irregular ordination of bishops. He was arrested by imperial troops in the winter of the same year, but escaped to an unknown location. The synod of Nyssa, which was convened in the spring of 376, deposed him. However, Gregory regained his see in 378, perhaps due to an amnesty promulgated by the new emperor Gratian. In the same year Basil died, and despite the relative unimportance of Nyssa, Gregory took over many of his brother's former responsibilities in Pontus. He was present at the Synod of Antioch in April 379, where he unsuccessfully attempted to reconcile the followers of Meletius of Antioch with those of Paulinus. After visiting the village of Annisa to see his dying sister Macrina, he returned to Nyssa in August. In 380 he travelled to Sebaste, in the province of Armenia Prima, to support a pro-Nicene candidate for the election to the bishopric. To his surprise, he himself was elected to the seat, perhaps due to the population's association of him with his brother. However, Gregory deeply disliked the relatively unhellenized society of Armenia, and he was confronted by an investigation into his orthodoxy by local opponents of the Nicene theology. After a stay of several months, a substitute was found - possibly Gregory's brother Peter, who was bishop of Sebaste from 381 - and Gregory returned home to Nyssa to write books I and II of Against Eunomius. Gregory participated in the First Council of Constantinople (381), and perhaps gave there his famous sermon In suam ordinationem. He was chosen to eulogise at the funeral of Melitus, which occurred during the council. The council sent Gregory on a mission to Arabia, perhaps to ameliorate the situation in Bostra, where two men, Agapius and Badagius, claimed to be bishop. If this is the case, Gregory was unsuccessful, as the see was still contested in 394. 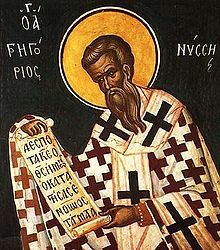 He then travelled to Jerusalem, where Cyril of Jerusalem faced opposition from local clergy due to the fact that he had been ordained by Acacius of Caesarea, an Arian heretic. Gregory's attempted mediation of the dispute was unsuccessful, and he himself was accused of holding unorthodox views on the nature of Christ. His later reign in Nyssa was marked by conflict with his Metropolitan, Helladius. Gregory was present at a 394 synod convened at Constantinople to discuss the continued problems in Bostra. The year of his death is unknown. The traditional view of Gregory is that he was an orthodox Trinitarian theologian, who was influenced by the neoplatonism of Plotinus and believed in universal salvation following Origen. However, as a highly original and sophisticated thinker, Gregory is difficult to classify, and many aspects of his theology are contentious among both conservative Eastern Orthodox theologians and Western academic scholarship. This is often due to the lack of systematic structure and the presence of terminological inconsistencies in Gregory's work. Gregory, following Basil, defined the Trinity as "one essence [οὐσία] in three persons [ὑποστάσεις]", the formula adopted by the Council of Constantinople in 381. Like the other Cappadocian Fathers, he was a homoousian, and Against Eunomius affirms the truth of the consubstantiality of the trinity over Eunomius' Aristotelian belief that the Father's substance is unengendered, whereas the Son's is engendered. According to Gregory, the differences between the three persons of the Trinity reside in their relationships with each other, and the triune nature of God is revealed through divine action (despite the unity of God in His action). The Son is therefore defined as begotten of the Father, the Holy Spirit as proceeding from the Father, and the Father by his role as progenitor. However, this doctrine would seem to subordinate the Son to the Father, and the Holy Spirit to the Son. Robert Jenson suggests that Gregory implies that each member of the Godhead has an individual priority: the Son has epistemological priority, the Father has ontic priority and the Spirit has metaphysical priority. Other commentators disagree: Morwenna Ludlow, for instance, argues that epistemic priority resides primarily in the Spirit in Gregory's theology. Modern proponents of social trinitarianism often claim to have been influenced by the Cappadocians' dynamic picture of the Trinity. However, it would be fundamentally incorrect to identify Gregory as a social Trinitarian, as his theology emphasises the unity of God's will, and he clearly believes that the identities of the Trinity are the three persons, not the relations between them. 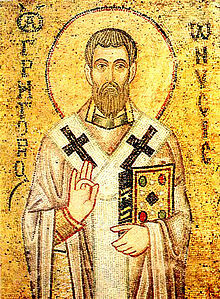 11th century mosaic of Gregory of Nyssa. Saint Sophia Cathedral in Kiev, Ukraine. Gregory was one of the first theologians to argue, in opposition to Origen, that God is infinite. His main argument for the infinity of God, which can be found in Against Eunomius, is that God's goodness is limitless, and as God's goodness is essential, God is also limitless. An important consequence of Gregory's belief in the infinity of God is his belief that God, as limitless, is essentially incomprehensible to the limited minds of created beings. In Life of Moses, Gregory writes: "...every concept that comes from some comprehensible image, by an approximate understanding and by guessing at the Divine nature, constitutes a idol of God and does not proclaim God." Gregory's theology was thus apophatic: he proposed that God should be defined in terms of what we know He is not rather than what we might speculate Him to be. Accordingly, the Nyssen taught that due to God's infinitude, a created being can never reach an understanding of God, and thus for man in both life and the afterlife there is a constant progression [ἐπέκτασις] towards the unreachable knowledge of God, as the individual continually transcends all which has been reached before. In the Life of Moses, Gregory speaks of three stages of this spiritual growth: initial darkness of ignorance, then spiritual illumination, and finally a darkness of the mind in mystic contemplation of the God who cannot be comprehended. Gregory seems to have believed in the universal salvation of all human beings. Gregory argues that when Paul says that God will be "all in all" (1 Cor. 15:28), this means that though some may need long time of purification, eventually "no being will remain outside the number of the saved" and that "no being created by God will fall outside the Kingdom of God". Due to the unity of human nature in Christ “all, thanks to the union with one another, will be joined in communion with the Good, in Jesus Christ Our Lord”. By his incarnation, death and resurrection Christ achieves "the common salvation of human nature". Gregory also described God's work this way: "His [God's] end is one, and one only; it is this: when the complete whole of our race shall have been perfected from the first man to the last—some having at once in this life been cleansed from evil, others having afterwards in the necessary periods been healed by the Fire, others having in their life here been unconscious equally of good and of evil—to offer to every one of us participation in the blessings which are in Him, which, the Scripture tells us, 'eye hath not seen, nor ear heard,' nor thought ever reached." That this is what Gregory believed and taught is affirmed by most scholars. A minority of scholars have argued that Gregory only affirmed the universal resurrection. In the Life of Moses, Gregory writes that just as the darkness left the Egyptians after three days, perhaps redemption [ἀποκατάστασις] will be extended to those suffering in hell [γέεννα]. This salvation may not only extend to humans; following Origen, there are passages where he seems to suggest (albeit through the voice of Macrina) that even the demons will have a place in Christ's "world of goodness". Gregory's interpretations of 1 Corinthians 15:28 ("And when all things shall be subdued unto him ...") and Philippians 2:10 ("That at the name of Jesus every knee should bow, of things in heaven, and things in earth, and things under the earth") support this understanding of his theology. Nevertheless, in the Great Catechism, Gregory suggests that while every human will be resurrected, salvation will only be accorded to the baptised, although he also states that others driven by their passions can be saved after being purified by fire. While he believes that there will be no more evil in the hereafter, it is arguable that this does not preclude a belief that God might justly damn sinners for eternity. Thus, the main difference between Gregory's conception of ἀποκατάστασις and that of Origen would be that Gregory believes that mankind will be collectively returned to sinlessness, whereas Origen believes that personal salvation will be universal. This interpretation of Gregory has been criticized recently, however. Indeed, this interpretation is explicitly contradicted in the "Great Catechism" itself, for at the end of chapter XXXV Gregory declares that those who have not been purified by water through baptism will be purified by fire in the end, so that "their nature may be restored pure again to God". Furthermore, in the next chapter (ch. XXXVI), Gregory says that those who are purified from evil will be admitted into the "heavenly company". Attempting to reconcile these disparate positions, Eastern Orthodox theologian Dr. Mario Baghos notes that "when taken at face value the saint seems to be contradicting himself in these passages; on the one hand he asserted the salvation of all and the complete eradication of evil, and, on the other, that the fire needed to purge evil is ‘sleepless’, i.e. everlasting. The only solution to this inconsistency is to view any allusion to universal salvation in St Gregory as an expression of God’s intention for humanity, which is in fact attested to when his holy sister states that God has “one goal […] some straightway even in this life purified from evil, others healed hereafter through fire for the appropriate length of time.” That we can choose either to accept or ignore this purification is confirmed by the saint’s many exhortations that we freely undertake the virtuous path." Dr. Ilaria Ramelli has made the observation that for Gregory free will was compatible with universal salvation, since every person would eventually accept the good having gone through purification. However, Gregory conceded that some sinners, such as Judas, might never be completely purified when he wrote, "that which never existed is to be preferred to that which has existed in such sin. For, as to the latter, on account of the depth of the ingrained evil, the chastisement in the way of purgation will be extended into infinity". Gregory's anthropology is founded on the ontological distinction between the created and uncreated. Man is a material creation, and thus limited, but infinite in that his immortal soul has an indefinite capacity to grow closer to the divine. Gregory believed that the soul is created simultaneous to the creation of the body (in opposition to Origen, who believed in preexistence), and that embryos were thus persons. To Gregory, the human being is exceptional, being created in the image of God. Humanity is theomorphic both in having self-awareness and free will, the latter which gives each individual existential power, because to Gregory, in disregarding God one negates one's own existence. In the Song of Songs, Gregory metaphorically describes human lives as paintings created by apprentices to a master: the apprentices (the human wills) imitate their master's work (the life of Christ) with beautiful colors (virtues), and thus man strives to be a reflection of Christ. Gregory, in stark contrast to most thinkers of his age, saw great beauty in the Fall: from Adam's sin from two perfect humans would eventually arise myriad. Gregory was also one of the first Christian voices to say that slavery as an institution was inherently sinful. He believed that slavery violated mankind's inherent worth, and the nature of humanity to be free; a departure from classical, and Judeo-Christian precedent which he rooted in Genesis, arguing that man was given mastery of animals but not of mankind. Although aspects of the slave system had been criticized by Stoics such as Seneca, this was the first and only sustained critique of the institution of slavery itself made in the ancient world. In Homilies on Ecclesiastes, he wrote: "'I got me slave-girls and slaves.' For what price, tell me? What did you find in existence worth as much as this human nature? What price did you put on rationality? How many obols did you reckon the equivalent of the likeness of God? How many staters did you get for selling that being shaped by God? God said, Let us make man in our own image and likeness. If he is in the likeness of God, and rules the whole earth, and has been granted authority over everything on earth from God, who is his buyer, tell me? Who is his seller? To God alone belongs this power; or, rather, not even to God himself. For his gracious gifts, it says, are irrevocable. (Romans 11:29) God would not therefore reduce the human race to slavery, since he himself, when we had been enslaved to sin, spontaneously recalled us to freedom. But if God does not enslave what is free, who is he that sets his own power above God's?" There are many similarities between Gregory's theology and neoplatonist philosophy, especially that of Plotinus. Specifically, they share the idea that the reality of God is completely inaccessible to human beings and that man can only come to see God through a spiritual journey in which knowledge [γνῶσις] is rejected in favour of meditation. 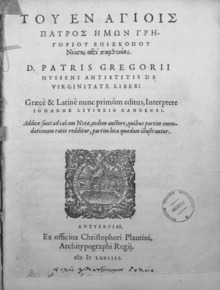 Gregory does not refer to any neoplatonist philosophers in his work, and there is only one disputed passage which may directly quote Plotinus. Considering this, it seems possible that Gregory was familiar with Plotinus and perhaps other figures in neoplatonism. However, some significant differences between neoplatonism and Gregory's thought exist, such as Gregory's statement that beauty and goodness are equivalent, which contrasts with Plotinus' view that they are two different qualities. Eastern Orthodox theologians are generally critical of the theory that Gregory was influenced by neoplatonism. For example, Metropolitan Hierotheos of Nafpaktos argues in Life After Death that Gregory opposed all philosophical (as opposed to theological) endeavour as tainted with worldliness. This view is supported by Against Euthonius, where Gregory denounces Euthonius for placing the results of his systematic Aristotelean philosophy above the traditional teachings of the Church. The Eastern Orthodox and Eastern Catholic Churches commemorate Gregory of Nyssa on January 10th. The Roman Martyrology commemorates the demise of St. Gregory Nyssa on 9 March. In modern Roman Catholic calendars which include the feast of St. Gregory, such as the Benedictines, his feast day is observed on 10 January. Gregory is revered as a saint. However, unlike the other Cappadocian fathers, he is not a Doctor of the Church. He is venerated chiefly in the East. His relics were held by the Vatican until 2000, when they were translated to the Greek Orthodox church of St. Gregory of Nyssa, San Diego, California. Gregory's work received little scholarly attention in the West until the mid-twentieth century, and he was historically treated as a minor figure in comparison to Basil the Great or Gregory of Nazianzus. As late as 1942, Hans Urs von Balthasar wrote that his work was virtually unknown. In part due to the scholarship of Balthasar and Jean Daniélou, by the 1950s Gregory became the subject of much serious theological research, with a critical edition of his work published (Gregorii Nysseni Opera), and the founding of the International Colloquium on Gregory of Nyssa. This attention has continued to the present day. Modern studies have mainly focused on Gregory's eschatology rather than his more dogmatic writings, and he has gained a reputation as an unconventional thinker whose thought arguably prefigures postmodernism. Major figures in contemporary research include Sarah Coakley, John Zizioulas and Robert Jenson. "Let us then, consider who were the venerable doctors and indomitable champions of the Church...[including] Gregory Primate of Nyssa, who all have called the father of fathers." "Gregory has often been credited with the discovery of mystical theology, or rather with the perception that darkness is an appropriate symbol under which God can be discussed. There is much truth in this....Gregory seems to have been the first Christian writer to have made this important point..."
"What interests me is the defining features of Gregory's vision of the just society: his unequivocal stance against 'the peculiar institution of slavery' and his call for the manumission of all slaves. I am interested in reading Gregory as a fourth century abolitionist intellectual....His outlook surpassed not only St. Paul's more moderate (but to be fair to Paul, in his moment, revolutionary) stance on the subject but also those of all ancient intellectuals -- Pagan, Jewish and Christian - from Aristotle to Cicero and from Augustine in the Christian West to his contemporary, the golden mouthed preacher himself, John Crysotom in the East. Indeed, the world would have to wait another fifteen centuries -- until the nineteenth century, late into the modern abolitionist movement -- before such an unequivocal stance against slavery would appear again." "Less prolific than Origen, less cultivated than Gregory Nazianzen, less practical than Basil, Gregory of Nyssa nonetheless outstrips them all in the profundity of his thought...."
Vol. 1 - Werner Jaeger, ed. (2002). Contra Eunomium libri I et II. Brill. ISBN 978-90-04-03007-7. Vol. 2 - Werner Jaeger, ed. (2002). Contra Eunomium liber III. Brill. ISBN 978-90-04-03934-6. Vol. 3/1 - Friedrich Muller, ed. (1958). Opera dogmatica minora, pars I. Brill. ISBN 978-90-04-04788-4. Vol. 3/2 - K. Kenneth Downing; Jacobus A. McDonough; S.J. Hadwiga Hörner, eds. (1987). Opera dogmatica minora, pars II. Brill. ISBN 978-90-04-07003-5. Vol. 3/4 - Ekkehard Mühlenberg, ed. (1996). Opera dogmatica minora, pars IV. Brill. ISBN 978-90-04-10348-1. Vol. 3/5 - Ekkehard Mühlenberg, ed. (2008). Opera dogmatica minora, pars V. Brill. ISBN 978-90-04-13314-3. Vol. 4/1 - Hubert Drobner, ed. (2009). Opera exegetica In Genesim, pars I. Brill. ISBN 978-90-04-13315-0. Vol. 5 - J. McDonough; P. Alexander, eds. (1986). In Inscriptiones Psalmorum: In Sextum Psalmum: In Ecclesiasten Homiliae. Brill. ISBN 978-90-04-08186-4. Vol. 6 - H. Langerbeck, ed. (1986). In Canticum Canticorum. Brill. ISBN 978-90-04-08187-1. Vol. 7/1 - John F. Callahan, ed. (2009). Opera exegetica In Exodum et Novum Testamentum, pars 1. Brill. ISBN 978-90-04-00747-5. Vol. 7/2 - John F. Callahan, ed. (1992). Opera exegetica In Exodum et Novum Testamentum, pars 2. Brill. ISBN 978-90-04-09598-4. Vol. 8/1 - Werner Jaeger; J.P. Cavarnos; V.W. Callahan, eds. (1986). Opera ascetica et Epistulae, pars 1. Brill. ISBN 978-90-04-08188-8. Vol. 8/2 - Giorgio Pasquali, ed. (2002). Opera ascetica et Epistulae, pars 2. Brill. ISBN 978-90-04-11182-0. Vol. 9 - G. Heil; A. van Heck; E. Gebhardt; A. Spira, eds. (1992). Sermones, pars 1. Brill. ISBN 978-90-04-00750-5. Vol. 10/1 - G. Heil; J. P. Cavarnos; O. Lendle, eds. (1990). Sermones, pars 2. Brill. ISBN 978-90-04-08123-9. Vol. 10/2 - Ernestus Rhein; Friedhelm Mann; Dörte Teske; Hilda Polack, eds. (1996). Sermones, pars 3. Brill. ISBN 978-90-04-10442-6. ^ Gregory of Nyssa: The Letters. Translated by Anna M. Silvas, p. 3. ^ For example, see Knight, George T. (1908–14). Schaff–Herzog Encyclopedia of Religious Knowledge. London and New York: Funk and Wagnalls. pp. 96–8. ^ "CHURCH FATHERS: On the Soul and the Resurrection (St. Gregory of Nyssa)". www.newadvent.org. Retrieved 2015-10-18. ^ "NPNF2-05. Gregory of Nyssa: Dogmatic Treatises, Etc. - Christian Classics Ethereal Library". www.ccel.org. Retrieved 30 March 2018. ^ Baghos, Mario (2012). "Reconsidering Apokatastasis in St Gregory of Nyssa's On the Soul and Resurrection and the Catechetical Oration". Phronema. 27 (2): 125–162. Retrieved 17 August 2013. ^ "Gregory of Nyssa, On Infants' Early Deaths". en.wikisource.org. Retrieved 9 July 2017. ^ D. Bentley Hart (2001). The ‘Whole Humanity’: Gregory of Nyssa's Critique of Slavery in Light of His Eschatology. Scottish Journal of Theology, 54, pp 51-69. doi:10.1017/S0036930600051188. ^ Gregory of Nyssa (1993). Homilies on Ecclesiastes. Translated by Hall; Moriarty. New York: de Gruyter. p. 74. ^ Homilies on Ecclesiastes; Hall and Moriarty, trs., de Gruyter (New York, 1993) p. 74. ^ "Parish History". Church of St. Gregory of Nyssa, San Diego. Archived from the original on 4 June 2012. Retrieved 22 January 2012. ^ a b Natalie,, Carnes,. Beauty : a theological engagement with Gregory of Nyssa. Eugene, Oregon. ISBN 9781630876678. OCLC 903899756. ^ Meredith, Anthony (1999). Gregory of Nyssa (The Early Church Fathers). p. 100. ISBN 9780415118408. ^ 1905-1988., Balthasar, Hans Urs von, (1995). Presence and thought : essay on the religious philosophy of Gregory of Nyssa. San Francisco, Calif.: Ignatius Press. ISBN 0898705215. OCLC 32457802. Ene D-Vasilescu, Elena (2017). "Chapter 55: Gregory of Nyssa". In Esler, Philip F. (ed.). The Early Christian World. Routledge - Taylor & Francis Group. pp. 1072–1987. Mateo-Seco, Lucas Francisco; Maspero, Giulio, eds. (2010). The Brill Dictionary of Gregory of Nyssa. Leiden: Brill. John J. Cleary, ed. (1997). The perennial tradition of Neoplatonism. Leuven University Press. ISBN 978-90-6186-847-7. Sarah Coakley; et al. (2003). Re-thinking Gregory of Nyssa. Willey-Blackwell. ISBN 978-1-4051-0637-5. Jean Daniélou (1956). "Le mariage de Grégoire de Nysse et la chronologie de sa vie" (PDF). Revue d' Etudes Augustiniennes et Patristiques. 2: 71–78. Stephen T. Davis; Daniel Kendall; Gerald O'Collins, eds. (2002). The Trinity: an interdisciplinary symposium on the Trinity. Oxford University Press. ISBN 978-0-19-924612-0. Giulio Maspero; Lucas F. Mateo Seco, eds. (2009). The Brill dictionary of Gregory of Nyssa. Leiden: BRILL. ISBN 978-90-04-16965-4. Metropolitan Hierotheos of Nafpaktos, Life after Death. Retrieved 22 January 2012. Pfister, J. Emile (June 1964). "A Biographical Note: The Brothers and Sisters of St. Gregory of Nyssa". Vigiliae Christianae. 18 (2): 108–113. John W. Watt; Jan Willem Drijvers (1999). Portraits of spiritual authority: religious power in early Christianity, Byzantium, and the Christian Orient. Leiden: BRILL. ISBN 978-90-04-11459-3. Herbermann, Charles, ed. (1913). "St. Gregory of Nyssa" . Catholic Encyclopedia. New York: Robert Appleton Company.